“Oh Travis, child, what is fear ? Fear ain’t nothing but a thing that moves us forward and makes us fight ’till we ain’t afraid no more.” (Kindle Locations 4362-4364). After he discovers the phenomenon of one way time travel, Stanley Graf sets his granddaughter Leigh upon the task of personally welcoming a Traveler from the past. They don’t know who will appear or what year they will come from, but the Grafs do know that the time travel doorway opens up every four years and that there are other restrictions on those who travel. The next Traveler to enter through the doorway in Delaware may be the Graf’s most important discovery yet! When plans to send the Traveler back in time at the appointed hour, exactly one year after the doorway first delivered the Traveler, start to unravel, could history itself be changed? Leigh has the important task of making sure time and history are not altered and the weight of this responsibility rests heavily on her shoulders, “To protect our visitors from the past, so that we may preserve history as we know it, and the future as we hope it will be.” (Kindle Locations 5303-5304). Time travel is completely bogus and entirely unbelievable as a premise, but Sbrocca takes the concept and convinces me of its truth. She gives underlying scientific technological explanations that had me believing in her time travel theory being plausible. And who better to travel through time then the historical figure she chose! Sbrocca’s premise and usage of time travel were both clever and riveting. The author chose a good idea and then made it into an excellent book. 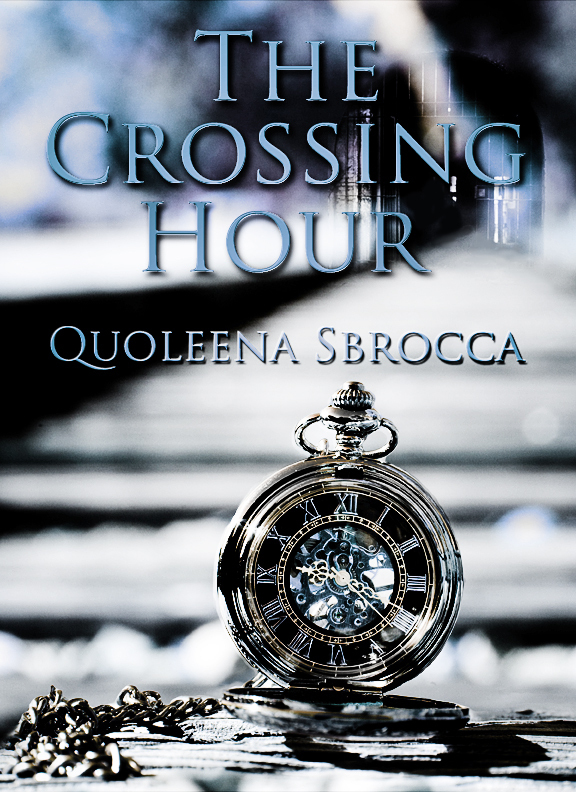 From the very first pages, Sbrocca delivers tension and intrigue in a powerful beginning to her novel The Crossing Hour. If I were to choose one word to describe this book it would be ‘authentic.’ The characters were believable and felt real, even the ones from other times and places. The characters’ motivations and desires were real and authentic. The dialogue was authentic and sassy and fun. I am absolutely smitten with Sbrocca’s clever idea of using a time traveler to introduce a specific speech pattern (19th century runaway slave) while still being set in modern, familiar USA. The reader is given a teaser into the past and how people spoke, but is not overwhelmed by this perspective. Every character has their own story and personality without being over the top or overly unique. The characters from the past stayed true to what I know of them historically. I loved that their personalities and actions stemming from who they were matched my perspective of how I thought those particular people would talk and act and what they would do in certain situations. This is a super cool technique and makes for great historical fiction writing. Two specifics: The chapter that went back in time to 2011 was a great idea and worked quite well in clearing up any questions that still lingered in the back of my mind. Second: after spending some time in present day technology cluttered USA, wouldn’t any curious time traveler simply ‘google’ themselves to find out why they are so important? This question nagged at me so persistently, but I was able to suspend my disbeliefs in sight of such an entertaining and well written story. This novel was published through CreateSpace Independent Publishing Platform on January 29th, 2015 and is available on Amazon here.